The Windup Girl is not an easy read. It takes an effort to absorb it, but then again, so many of the better things in life take effort. To me, this book is like on of the wood carvings you can buy in Chiang Mai to hang on your wall. At first glance, it looks like a nice carving, be it a forest or an ancient mythological scene. But as you gt closer, the detail surprises you: a small bird behind a branch, a gecko climbing a rock, a deer's eyes peering from the undergrowth. When first reading this book, the storyline is the focus, but then all the little details start hitting home. I work in Thailand, and for me, the "Thainess" of it was welcome, even if not always accurate (pad siew is not spicy, nor do Thais chew betel nuts, for example.) Bangkok, even a Bangkok of the future, was readily recognized. The science of the author's future was fascinating. Some, to be honest, made no sense. Why would a windup girl be designed to overheat when some of her duties might be to dance or provide sexual services? Smooth skin alone would not result in this. And why would spring guns be any more "green" than modern firearms? But after I got into the book, things like this simply did not bother me. I got caught up the universe in its entirety, and as such, spring guns and overheating windup girls could be accepted as part and parcel of this delicious world. 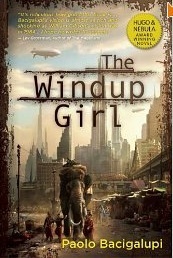 "The Windup Girl" is dystopian fiction, but unlike many other such books, it does not attempt to preach. The book simply describes. Any message taken has to be gleaned by the reader. As I read this book, I was able to transport myself into the author's vision. I felt like I was there, I could hear, feel, smell, and taste what was going on. I was an impartial observer, though, as except for the windup girl herself, I did not feel too much for any particular character. I was just there, reading, absorbing, the entire story. This book is the result of the authors prodigious imagination and his ability to put his vision to paper. It was a true pleasure to read. For more reviews or to buy The Windup Girl from Amazon.com, click here.